“Airtel Reversal data” is a new service introduced by Airtel NG to help subscribers reverse mistakenly subscribed data bundle within 24 hours provided the main data wasn’t used. Now I have a trick that will allow you enjoy unlimited data through Airtel Reversal data cheat. This can be seen as a new airtel free browsing cheat in 2019 but you need to first subscribe to a data plan before it works. 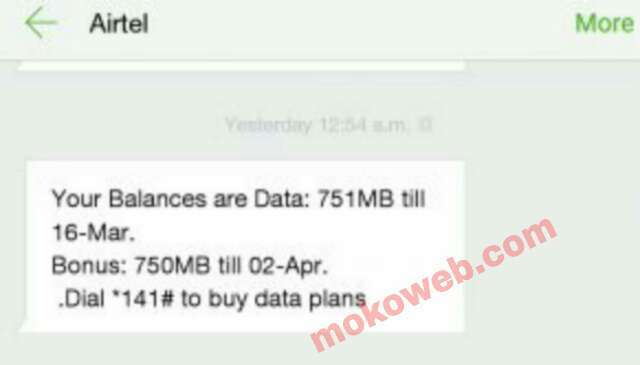 To enjoy this airtel data reversal free browsing cheat, you need to subscribe to a data plan, use ONLY the bonus data and reverse the subscribed data plan under 24 hours. By so doing, you have used free data while you get your money back. You can actually do this as many times as possible meaning it’s possible to enjoy unlimited data. Follow below steps to activate this cheat on your airtel line. Subscribe to any Airtel data plan of your choice with bonuses by dialing *141#. After using the bonus data, you can then reverse the initial money you used in subscribing by dialing *121*6# and your data will be reset as well. Get more free data by subscribing again with your reversed Airtime and use only the bonus data only again. Continue repeating this same steps after 24hrs to enjoy as many data as possible. This is a simple trick to enjoy free browsing on airtel in Nigeria and should be followed strictly. Therefore you must avoid subscribing to a package that has night plan bonus. Also avoid using the main data else, Reversal won’t work. Just be careful and use only the data bonus.